“When I delivered my Dad’s eulogy in September 2014, I felt like a ton of bricks had landed in my lap as my head was spinning from the sudden and unexpected loss of my hero, our beloved Dad. Looking back, I now know there were no words available to me at the time to capture the essence of a man like our Dad, especially only a few days after losing him to cancer — nine days after he walked me down the aisle on my wedding day. His unexpected passing followed the devastating loss of our baby sister, Kass, to cancer in 2012. The unexpected passing of my beloved Dad has taken a toll on our entire family. For me personally, I still have not been able to wrap my head around a life that does not include my Dad or my sister, Kass. Last Christmas was a fog. I was literally going through the motions and trying to make it seem like everything was okay when it truly was not okay. It is as if life is moving on and your entire world has been shaken to its core. Everything you have known over your four decades of life is changed forever. Yet, as a society, I do not believe we deal with grief very well. We give people five days off from work and then expect them to head back there ready to perform. We do what we have to do. But, the pain never subsides. As Christmas approaches, I have been thinking continuously about my Dad and the many gifts he gave to me for which I am forever indebted. Those daughters out there who have lost their Dad understand this fact: there are truly no words to capture the ache and the pain of saying goodbye to your Dad. It is indescribable. If I had a chance, these are the 44 things I would tell my Dad on Christmas Day this year, one thought for every year of my life that my Dad was with me. I talk about you and to you every single day. I think I always will. 2. You were the absolute epitome of what fatherhood should be: love, example, honor, integrity, with just the right amount of toughness and tenderness. 3. I lived my whole life wanting you to be proud of me. I find comfort in knowing that you were always so proud of all of your kids. That means the world coming from a man like you who had all of the gifts and accomplished so much. 4. I could never repay you for living your entire life as an advocate for children, most especially your own. 5. I am forever grateful to you for allowing us to be who we are, to try new things, to explore our surroundings, and to create with our own hands. I remember our childhood with such great joy. We were always outside playing in the yard, walking in the woods, sitting around a campfire, telling stories, singing songs, sled riding, cross country skiing, climbing trees, building a fort, painting a picture, whatever it was. Always outside. Always having fun. 6. When I hike, I remember you holding me on your shoulders as we walked through the woods in the Adirondacks when I was just a little girl. Thank you for introducing me to the natural world and all of its splendor. I never hike without thinking of you. 7. I talk about you to your grandkids all of the time, as I am sure Tim and Tom do, too. We look at old pictures and videos and they laugh and recall their own tales. I beg them, “Please do not forget about your Bop/Pap.” One day, Katie said, “How could we ever forget him?” Still tears me up…. 8. I miss sitting on the deck drinking wine with you and Mom. Talking about the latest news or whatever was on our minds and hearing your always-wise perspective on the world. 9. In the uncertainty of the world we now live in, I often wonder what you would have to say. From politics, to terrorism, to education, to the economy, you always had knowledgeable and insightful opinions about the world around you. I always admired that in you. I miss your thoughts on so many things. 10. I walk through the fields at the farm and long for you to walk beside me, pointing out the trees in the woods and the birds in the meadow. How did you know so much about everything? 11. In fact, there is not anywhere I can go on this property without hearing your voice, remembering being there with you at some point in time, and feeling a sense of peace for the opportunity. 12. I wish I could tell people about what was in your heart. I think most people saw the straight-talking, business-like side of you. I bet so many never truly understood what was going on in your insides. You had a heart of gold and cared so deeply for people. You always put others above yourself and you gave your whole life to your family. I bet not many people knew those things about you. But, we always knew. 13. I wish for so many of your gifts, but the way you could tell a story…..that is your gift I long to have. You always had a story and you always told that story so well. So many of your friends have told us how much they miss hearing your stories since we lost you. Another of your many gifts. 14. I am grateful that every big moment in my life always included you. You never missed one single milestone or meaningful moment over the 44 years we spent together. Not one. As I have grown older, I realize how special that fact is and how so many other kids in this world have not been as lucky. I never took for granted the warmth of looking up and seeing you and Mom in the crowd. Always. 15. I miss your laugh. It was unmistakable. A belly laugh of sorts. I also miss your “all in” laugh that forced you onto the floor, on your hands and knees, holding your head, laughing so hard that you cried. I will never forget the drive to Disney when you had to crawl out of the restaurant because you could not stop laughing. I miss those moments when everything seemed right with the world. 16. That train set with the beautiful scenery, the little village with the ice skating rink, and the white church steeple….the one that you set up in the family room every single year of my life at Christmas. I sure do miss it. I miss watching you showing it to your grandkids and watching their eyes light up as the train passed by. You once told me that you always wanted a toy train when you were little and now that you could have one, you would always set it up at Christmas. 17. Living in your spaces for the past 6 months has been difficult. Seeing the stack of books you loved to read still sitting near your nightstand reminds me of you constantly. But, just as the sadness falls over me, I am engulfed in a blanket of peace knowing that this is where you lived and where I now live…sharing your same spaces is another treasured gift. 18. We stacked enough wood for the winter, which has been quite mild. “El Nino,” you would say. “That is why the winter is mild.” And, you would explain the warm ocean currents on the west coast and how they affected our weather here. When we stacked the wood, we saw your handwritten notes on the wood shed, recalling the date, how many cords you stacked that day, and the list of who was there to help. Your last entry was July 2014, two months before we said goodbye. It brought tears to my eyes but helped me to know that what we were doing was carrying on for you, right where you left off. 19. We plan to restore your greenhouse next spring. I want to replace the broken glass that broke over last year’s strong winter. We were not able to keep up with your gardens last year, but we plan to restore most of them in the coming years. We will start with the greenhouse and Kass’s Garden that you loved so much. Then, we will work on the raised beds and then on your main vegetable garden. I admire the work you did on these gardens over the years. I have come to understand just how much work you did on this property. I am in awe of your strength to keep up with it all after 75 years of living. 20. I often wonder what you might say about the new addition we are adding to the house. Your house. We keep Mom involved in each and every decision we make. We ask her, “What do you think Dad would say?” She always says, “He would just be happy that you are here with me.” That makes me happy. I do hope you would be proud of what we are trying to do here. Someday, I know we will accomplish your dream for Stillmeadow Farm. 21. The gift of your writings that you left behind is a treasure beyond imagination. Seeing your handwritten words on page after page of your writings has been a most special gift to treasure. Reading your words provides even more richness to my life. I continue to be mesmerized by your greatest gift, the written word. 22. I long for the smell of the kitchen on a Sunday afternoon when you were cooking and had invited us all up for dinner. Walking through the front door never changed over those years. The experience was always the same. The smell of candles burning, wood burning in the fireplace, music playing, the warmth of the air, and your big smile as you greeted us, wine glass in hand, cooking towel over your shoulder, with a great big hug, “hello, my dear.” We knew we were in for another great afternoon filled with laughter, stories, and making plans for the future. 23. When I take Kato out early in the morning before the dawn, I always look up hoping to find you and Kass in the night sky. It is quiet here then. I think about how you were always up early and likely stood in these same places, planning out your day with a list of chores well beyond accomplishment within a 24-hour cycle. I know that somehow, you always found a way to get it all done. I hear the rocks crunch underfoot as I make my way back into the house and I am reminded that you are still here. 24. We still walk to the cabin on Thanksgiving and Christmas. Just like the tradition you started, we have continued to go there, even though it does not feel the same. We always feel you there with us, for one cannot be there without you being there. Mom told me that you used to walk there every day with Jebbie to write, to paint, to sit, and to be. You have left such a special gift for us. We will treasure it always. 25. Tim, Tom and I had a nice talk about you over this past Thanksgiving. It was a very special moment between just the three of us. I was talking about how hard it has been to move forward without you. I know they are hurting, too. Grief is a very personal experience and we all have to walk our own path. 27. I hear your voice in my head frequently. It is usually when I am in a moment and I wish you were there. You say to me “Enjoy yourself, Krista. Enjoy your life! It goes by so fast. Do not wish it away and do not look back. It is okay.” I know these words because you said them to me too many times to count after Kass died. 28. Mom found a handwritten list you wrote of every tree you identified on your property over the years. I thought to myself, “Who does that?” Such a treasure! We will frame it and hang it in our new addition and every time I see it I will be reminded of the amazing man you were. 29. You were just a unique person, Dad. I am not sure how else to explain it. I have met so many thousands of people from all over the country, and the world for that matter, through my work and travels over the years. So many people, and I have yet to ever meet someone as wise or as interesting as you. You were a treasure and a gift from God. 30. I have called upon the strength, courage, and perseverance that you instilled in me too many times to count since the day you died. I am grateful that the reserve you built up in me is wide and deep. Life has not been easy, but I have never once doubted that I would make it through the sadness. “In adversity is where we find our true strength,” you would always say. How I have needed these lessons over these past months. 32. I want to ask you what Heaven is like and if it was Kass with you in that hospital room on the day you died. I would also want to know how she is doing there, standing beside you once again. 33. Your greeting for me was always the same over the years: “Hello, My Dear.” I remember it always. On the phone, in person, it was always the same and the first thing you always said to me. Oh, to hear those words again, Dad. I still hear you saying it in my dreams. I was so honored to be your dear…. 34. I treasure the relationship I had with you, Dad. I have always believed that Dads raise daughters and Moms raise sons. We could not be more alike. I still hear it from others all of the time and I take it as the biggest compliment. I always felt steady and secure in my life because you were always there to help me through the rough spots. 35. I am eternally grateful for all of the things you taught me: how to drive, how to fish, how to plant a garden, how to check my oil and change a tire, how to shoot a gun, how to ride a bike, how to climb a tree, how to build a fire, how to throw a ball, how to cook pasta, how to paint, how to find the Big Dipper in the night sky, how to balance a checkbook, how to launch a rocket, how to make a bluebird house, how to tap a tree, how to use a drill, how to read a map, and how to do 1,000 other things that I now do without a thought. You taught me all of those things. A treasured gift I can never repay. 36. You also taught me: to look at the sky, to spend time in stillness, to write, to read, to live with purpose and passion, to forgive, to enjoy solitude, to know my surroundings, to be humble, to never forget where I came from, to have compassion for those less fortunate, to believe in myself, to laugh even when my heart wants to cry, to believe in God, and to have faith that there is eternal life. 37. There were no words left unspoken between us and this has been the greatest gift. No regrets. Nothing left unsaid. Just genuine love, respect, and admiration from a daughter for her Dad. 38. I would give everything I own for just five more minutes with you. I would ask you: “How am I doing, Dad? Am I doing okay?” I would ask you this because I really have no idea how I am doing. You were my guidepost…my mentor….my North Star. I could really use your reassurance that I am going to be okay. And, that you are okay, too. 39. I was heartbroken the day you died. Truly heartbroken. I did not know what to do. I still do not know what to do. But, as you taught me, I trust in God that there is a purpose for all of the pain and that someday, it will be revealed to me. 40. I feel blessed and honored to be chosen as your kid. 41. I do not really know how to live without you, but I am trying. 42. I owe everything I am to you. You gave me the greatest gift: you believed in me. It is a gift I can never repay. 43. You being my Dad has been the best part of my life. 44. Merry Christmas! I truly love you, Dad. Until we meet again…..
At the Triangle Tavern, December 2012. One of my favorite pictures of me and my Dad. If I had to pick one picture that captures the grace and love of my sister as she faced her last days on Earth, it might be this one. I had rented a wheelchair for Kass because she was having trouble walking and could not get around as well as she used to. She was tired. Both her legs and her mind had grown weary. But, her heart? Her heart was fierce and strong. It was a perfect Saturday in June 2012. The three of us, Kass, me and Josie; spent the entire day together. Kass wanted to go to the mall to “feel normal for a day.” She wanted to take Josie to the Gap to buy her some clothes. I pushed her around the mall and could not help but notice people watching us. I knew that everyone who looked must have made the connection to Josie, who walked beside us. They knew they were mother and daughter by the gentle way they interacted together. My hope that day was seeing Kass and Josie that day made them pause and appreciate their own blessings, if only for a moment. We went to the Gap, but I had trouble maneuvering Kass’s wheelchair through the clothes racks, which were jammed so close together that a wheelchair could not pass. I ended up parking the chair in the middle of an aisle and asking Kass to tell me what to grab for her. Kass was so good at picking out cute outfits. She always had been. She was so stylish and beautiful all those years. Josie seemed excited. Kass smiled, which made me smile. We left the mall and stopped for ice cream. And then, we went to the park. As Josie played close by, Kass and I talked about the future. It was in these moments that I forever changed as a person. Written words could never capture how a conversation like this affects you to the depths of your soul. Listening to Kass’s words that day made me realize there was no going back to life as normal. While we talked, Kass shared with me her hopes and her dreams for her daughter, and to this day the thought of it makes me weep. When we left the park, we returned to Kass’s home. I asked if she wanted to go for a walk up the road. She looked at me perplexed. “We can’t use the wheelchair on the gravel road.” I said, “Wanna bet? Let’s try.” And, off the three of us went down the gravel road outside of her house. For the most part, our walk was quiet, as we both contemplated our conversation from earlier in the park. On our way back to the house, I saw Josie grab her Mommy’s hand and keep on walking. I quickly and quietly took this picture. I’m not even sure I ever showed it to Kass. But, I know in my heart how much she would have loved it. They stayed like this for some time. I saw Kass wipe at her tears. Today, I share this special moment to celebrate the huge heart, bright smile, charisma, grace, strength, and inner beauty of my dear, sweet sister whom I remember and miss with every breath. She remains my greatest example of grace. How did she ever make peace with letting go of her little girl, whom she loved so much? A moment that lives forever in your heart even without the photograph….. Thank you for showing me the path to grace and love, Kass. Not one day has passed since the day we said goodbye that your life here on Earth has been forgotten. Not a single day. And, so shall it be for as long as those of us who loved you continue to share the gifts and lessons of love you left behind and to shine a light on the genuine goodness and kindness in your heart. There will never be another you, and there will never be another us. My soul sister. My best friend, secret-keeper, holder of truth, bearer of hope, and vessel of love. I’ll keep telling the world, especially Josie, that we lost one of life’s greatest treasures the day you had to go. I find peace in knowing that Dad is with you now, and that you both continue to watch over us from above. It’s for this reason that I spend so much time looking up…. I loved you in all of my yesterdays, I feel you in every today, and I will look for you with the dawn of every tomorrow….until I see you again, sweet Kass…..
Running for Hope Celebrates Four Years! It is hard to believe that December 2016 marks the end of my fourth year of running a monthly 5K for our Foundation! What started back in January 2013 between me and my friends Amy, Kelley, and Christine as a one year commitment to run a monthly 5K in memory of Kass, has grown into a monthly celebration of life. Of hope. Of love. Four years and going strong. I am grateful to the people who have joined me along the way, most notably Amy, Kelley, Christine, Leslie, Kelly, Nora, Tina, Pete, my brothers and my Dad and Mom, and all of the countless others who have supported this effort. I am grateful most especially to Jamie who has been my rock and my biggest fan each and every step of the way. Dropping me off at most of the starting lines, waiting for me at countless finish lines, and always encouraging me to keep going no matter what. He is a treasure to me! Plainly and simply. I have completed races in 18 communities including Hughesville, Muncy, Unityville, Loyalsock, Williamsport, Jersey Shore, DuBoistown, South Williamsport, Warrensville, Lewisburg, Bloomsburg, Wilkes Barre, Millville, Milton, Harrisburg, Philadelphia, Allentown, and Washington, D.C. I have completed 48 5Ks and 3 half marathons, and an 8K since January 2013, comprising about 190 miles. Taken separately, these miles are the equivalent of running 7.25 full marathons in four years! I have run in support of many important community causes, including: Lewisburg Rotary, Flight 800, St. Columba School, East Lycoming YMCA, Run for Your Heart, K’s for Cancer, East Lycoming Foundation, Little League, Crosscutters, Williamsport Schools, May Day, Rider Park, Home to Haiti, Muncy Schools, Country Store Kicks Cancer, Sheetz Color Run for Kids, YWCA, Race Against Addiction, and many more. I have learned so much about all of the good causes happening in our community. After four years of running, I still get choked up when I cross the finish line. I always finish the same. Looking up, throwing a kiss to the sky, then a fist in the air in victory. I have never won a race. I have never come close to winning. Not even my age group. But, I have never cared about my time. The victory for me is in the experience of waking up on race day, feeling proud that I have found a way to keep going, wearing my Foundation shirt, going to the race, running with my heart wide open, and crossing the finish line in memory of those I love. Winning a medal could never replace that feeling. People have asked me when I am going to stop. I cannot imagine a time when I will say “that’s enough.” I plan to keep running until I am unable to run. It is then that I will walk. When I can no longer walk, I will figure out what is next. Until that day, I will run. I have never used this initiative as a fundraiser, but some very generous folks have donated to me along the way. I am grateful for every dollar we raise. If you are interested in supporting my running, please consider a donation to our Foundation in any amount. Each donation is considered a blessing! I cannot explain why I keep running. I guess it is the one thing I can do to feel some sense of control after the terrible toll the loss of my Dad and sister has had on me…and continues to have on me. Many will never understand my journey, and that’s okay. I run to find peace in my heart. I run to honor the life, legacy, and love of two people I loved most in the world. I run to build hope for tomorrow. I run for life. I run for love. Most of all, I run for all of those who can no longer run. Because I can. I run for Kass and my Dad. Because I love them and I miss them every single day. I made this 3-minute video to highlight some of my runs over the past four years. The video is set to the beautiful voice of Alicia Keys and the most amazing lyrics….Not Even The King…. This post was written to remember the 2nd anniversary of our Dad’s passing on September 8, 2014. This is just one of 1,000 stories left to write about a man who was unique, loving, wise, and a pure treasure. His laughter, his life, his love will never be forgotten. September 2013. It is Sunday afternoon. I step from the sidewalk onto the floorboards of the old front porch. The movement of my feet causes those aging boards to creak. The sound alerts the dogs sitting just inside of the door. Jeb, my parent’s German Shepard, has been the old guard on duty here for almost a decade. He is the chosen one of sorts, the keeper of the gate and the protector of his precious family living inside. Buddy, the rescue dog, is standing by supporting Jeb with a complementary yet alternating bark, providing extra cover just as any good second-in-command should do. The barking is intimidating, and if I did not know any better, I would turn around and try again on another day. But, I do know better. For this is my home. A place I left over 21 years ago in search of my own dreams. Straight out of college and into my first apartment that I shared with my little sister, Kass, who was still in college at the time. We only moved 30 minutes away, but for two kids new to living completely on their own, it felt like we had moved across the country. After that first move, chasing dreams took us both further down the road away from home and on to new jobs, new cities, and new experiences. My brothers stayed closer and settled into their own lives, filling up their days with activities and sports for their kids, work, and simply taking care of business. Two families with all of the trimmings. Stillmeadow Herbs. The old sign still stands tall in my Dad’s handwriting with his painting adorning the bottom. But, no matter where our lives took us, we never forgot where we came from. Stillmeadow, the name given by my parents to their 16-acre domain, would always be our home. The safe haven. A soft place to land no matter what life was serving up at the time. And over the course of those years when the four of us were creating lives of our own, we gathered regularly in the kitchen at Stillmeadow for compelling conversation, great debates, outstanding food, laughter, and unconditional love. Today, I know Mom and Dad are expecting us. Lately, this is a common occasion for most of our Sunday afternoons. The phone call would come in sometime before noon. “Kris, it’s Dad. I put a little something on the stove if you and Jamie want to come over for an early dinner today.” “Wow, Dad, yes. Of course. That sounds great.” I ask Jamie if he wants to go. There is never a doubt as to his answer. During the drive out to their house, his game is always the same as he tries to guess what will be on the menu on that particular day. My Dad is a phenomenal chef and he loves to create new dishes. One thing we learned over the years is that when Dad cooks it is always homemade, usually an amazing Italian creation he cooked up in his head, often incorporating items from his garden, and always delicious. Dad standing in the kitchen we still love with the old wood stove in the background. This photo was taken exactly six months before he left us for Heaven. It is always the same. Same appearance. Same words. Same smile. Same hug. This greeting is not only offered when I see my Dad in person, but in almost every instance that I interact with him…on the phone, in his voice mail messages, in his email greeting, when I meet him for coffee or a drink, when he stops by my house to visit. It is always the same greeting filled with such warmth and love: “Hello, my dear.” I love being his daughter and his dear. As I hug him tightly, I can smell his perfect scent through his work clothes. I smell the candles burning, I smell something delicious simmering on the stove, I hear the soft music playing in the family room, and feel a warmth in the air. I give him a kiss on the cheek and say, “Hi Dad.” Jamie follows me in and it is then that I see Mom coming into the kitchen. We all exchange greetings and I know that our afternoon is going to be filled with laughter, sharing old stories, and a few life lessons and casual advice for me. All of that and an exceptional meal. It is moments like today that I will never forget. September 2016. It is 8:00 a.m. on a clear Saturday morning. I step onto the front porch. The new floorboards do not creak like they used to. As I make my way to my car, my eyes are drawn skyward, as they usually are, and I catch a glimpse of the cloud formation overhead. White, puffy, cumulus clouds dominate my view. It looks like it is going to be a beautiful day. The birds chirp happily in the trees and our farm kitty, Bella, makes a run for the barn. I cannot help but think that it has almost been two years since we lost Dad and a year since we purchased and moved to Stillmeadow to be with Mom. It is still hard to fathom that Dad passed just two years after we said goodbye to Kass. Life does not seem fair. Some days, in fact most days, I still have trouble wrapping my head around any of it. But, instead of trying to sort it all out today, I just keep moving. I keep moving forward one day at a time just as Kass and Dad would have wanted. It is the thought of this moment that brings me peace. This is what the picture of this moment always looks like in my heart. The new front porch with Bella standing guard. The same love inside, just a new entryway. Post script: Sadly, we lost Buddy suddenly in April 2014. Dad and Mom then adopted Abbie and Jennie, two German Shepard/golden retriever sisters who still live at the farm along with their new brother, Kato. Buddy, the sweet rescue pup, in 2013. We said goodbye to Jeb in January 2016. In early October 2014, Mom and I were reminiscing about Dad and re-playing family videos on the computer. When he heard Dad’s voice, Jeb whimpered softly for several minutes. I believe if dogs can cry that Jeb cried that day. He missed Dad. They were the best of friends. Forever faithful, Jeb was 11 years old. Always together. Jeb and Dad, 2014. Dad always loved his dogs so much. The puppies were only five months old when he passed away. They still miss him everyday. Just as we all do…. Abbie (left) and Jennie (right) as puppies. They are now 2.5 years old. Such sweet girls. Harnessing Hope Bags Come From a Beautiful Place! 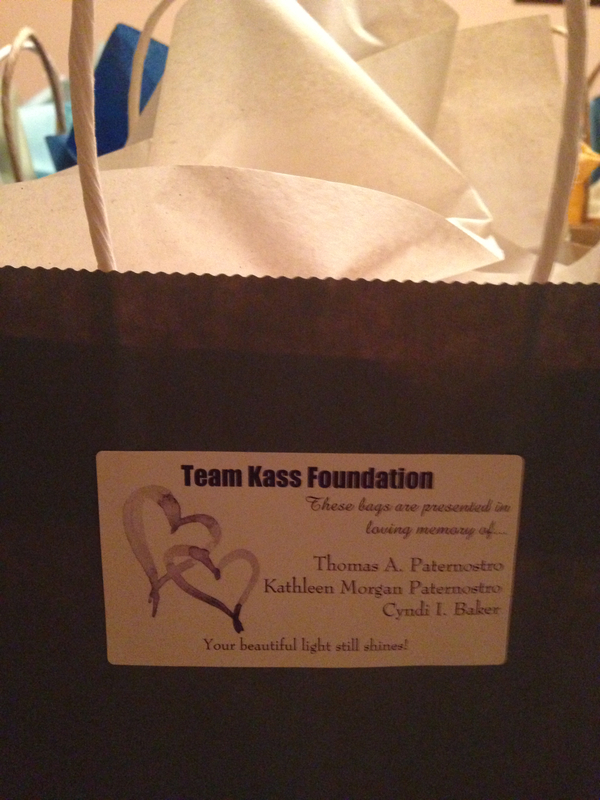 In March this year, we started an initiative through the Team Kass Foundation called Harnessing Hope Bags. The concept for this program came from my Mom and was raised for the first time during our Foundation Board meeting in February 2014. The concept was simple and came from such a beautiful place. As my Mom recalled sitting next to Kass through numerous chemotherapy treatments, she remembered the items Kass liked to have close by to help with the environment, including snacks, hand cream, mouthwash, wet wipes, etc., each intended to provide a little comfort through the uncomfortable parts of the cancer journey. We also recall writing down moments of laughter, conversations worth noting, information about medications, ideas for the future, etc., and my Mom always had a little notebook handy. It is in this spirit that once a quarter, we collect all of these items and place them in a harnessing hope bag with great care. We include information about our Foundation and what inspired us to do this…our courageous sister Kass who never lost hope throughout her journey! The expectation is that people who are new to this cancer journey may feel a little better, a little lighter, if only for a moment, because Kass’s beautiful light shines briefly in their space. Since March, we have delivered 85 bags to the Susquehanna Health Cancer Center to be distributed to newly-diagnosed cancer patients. Our Dad was an integral part of this initiative. He helped with defining the final contents of the bag, and of course, he was a strong proponent of including the journal. Since his passing just 2.5 months ago from cancer, our hearts continue to beat; yet they are broken, battered and bruised by yet another terrible loss for our family. This time, we lost our patriarch, our strength, and our beacon of light and laughter. Beyond all measure, this is the time for us to dig deep and to regain our footing as we continue walking on the path toward hope. If we lose our hope, then what? We will never give up. We will continue walking forward until no other family has to endure using the word “cancer” as a part of their daily conversation. Our Dad and the Number 2 pencil! the other lives he touched. He was a gift from God and we were so lucky to stand in the light of his love for so many happy years. Please take a moment to read about his treasured possession, the Dixon Ticonderoga Number 2 pencil, and how we incorporated them into this round of bags. In loving memory of three special people! 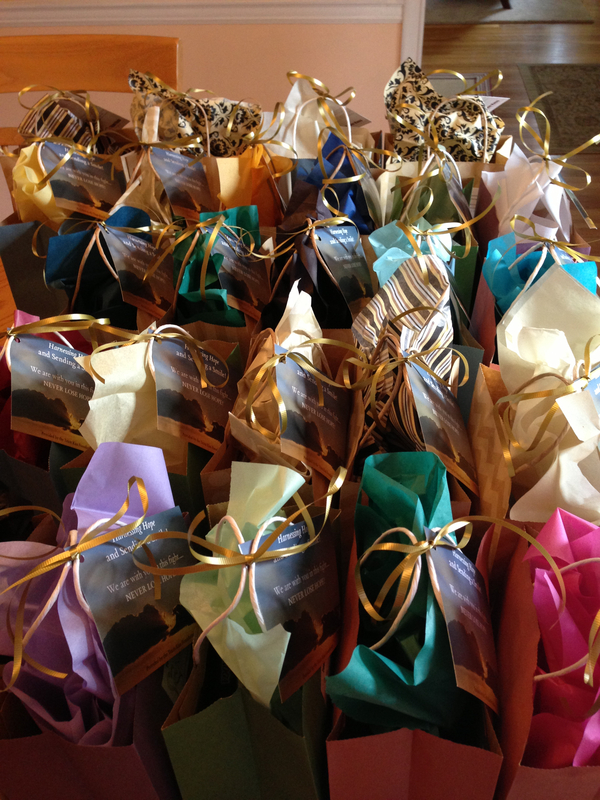 we have included Cyndi Baker’s name in loving memory on our gift bags this round. 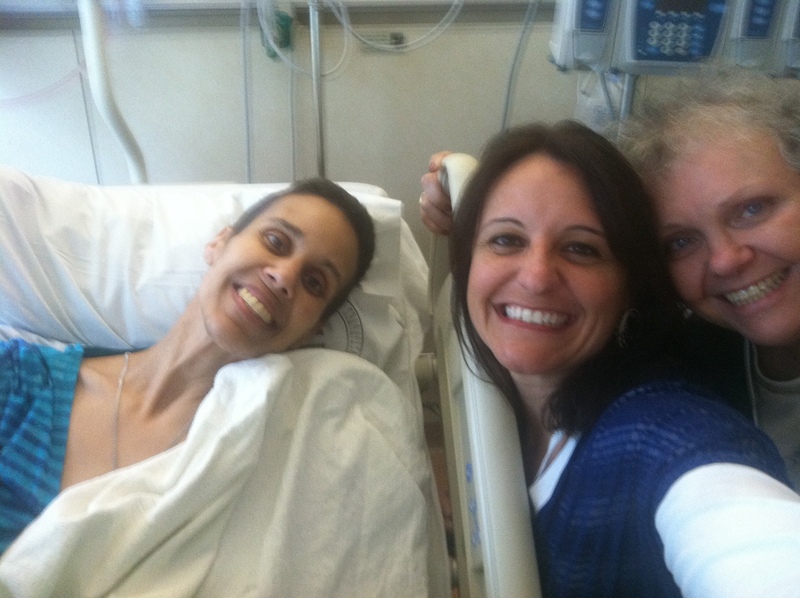 Thank you to Deb B. for your generosity of spirit and for loving your friend Cyndi. May her memory long endure! To see how you can help with this initiative, please contact us at teamkassfoundation@comcast.net. To make a donation, please send your gift to Team Kass Foundation, PO Box 1862, Williamsport, PA 17703 and mention Harnessing Hope Bags in the memo! Today is my birthday. I am a big fan of birthdays. I usually love my birthday and always find a way to stretch it out over the entire month of April. 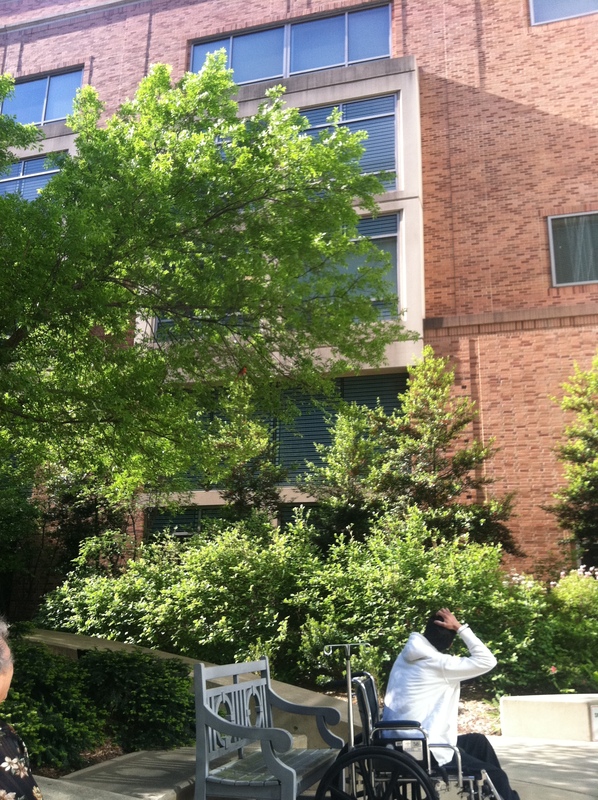 On Sunday, April 1, 2012, my Mom, Kass and I left for NIH for what we thought would be a routine week, if there is such a thing on a cancer journey. I packed enough clothes to be home by that Friday, April 6. However, we did not arrive home until the following Thursday, April 12. I will spare a lot of the details of this trip that I captured in my journal as it was all happening. Let’s just say that things took a bad turn during this trip to NIH. Kass had to undergo emergency surgery and we found ourselves in this new territory. I stayed in Kass’s hospital room with her for almost every one of those 11 days. I slept on a chair in the corner of the room. Sometimes, I lay next to Kass in her bed. Other times, I sat with her and listened to her talk. I know she did not sleep. I know that I did not sleep. It wasn’t that we did not sleep because of the hospital noise; we did not sleep because we were both scared. For the first time over this period, I saw a new sadness in Kass’s eyes. I hear the nurses come in and do their checks throughout the night. I saw the look on their faces. I know Kass did, too. I would ask them questions “Is everything okay?” “How is she doing?” I was so emotionally drained. I remember leaving the room to go cry in the hallway, only to dry my tears and return to the room trying to be upbeat and positive. I knew I had to be strong, but I was way out of my league. Looking back, this is the first time I allowed myself to think, “I am going to lose my baby sister and I don’t know what to do.” Quite frankly, I was terrified. So, I will never forget my birthday that year. And, I know that no matter how many years pass, I will always equate this day, my day, with this experience. Kass needed some new clothes to deal with the road ahead. So on that Wednesday, April 11, I went to Target to pick up some new clothes for her for the next few days and the trip back home in the morning. I told Kass I would stop by the Cheesecake Factory to pick up dinner. 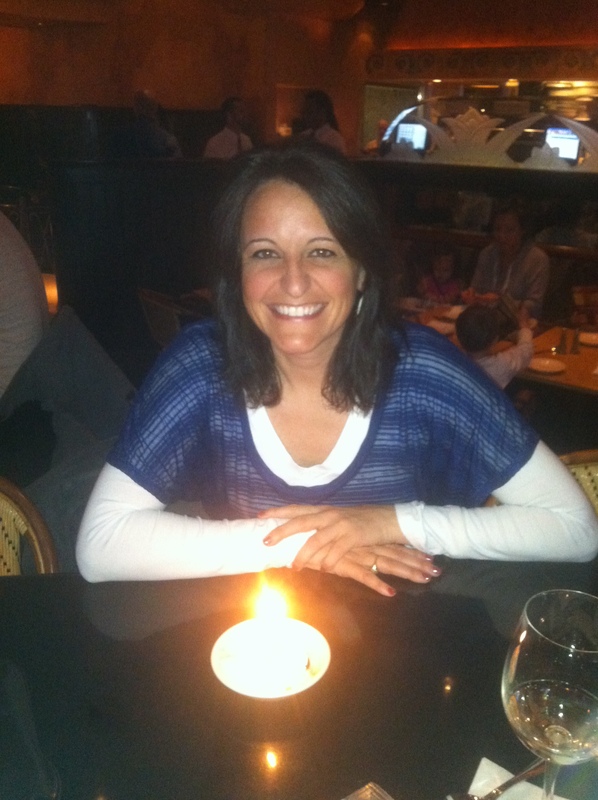 Birthday at Cheesecake Factory, 2012. It was always the three of us…. Kass gave me an NIH sweatshirt as my birthday gift that day. I wore it a lot after she left us for Heaven, but now I treat it as a treasured gift – the last one I ever received – from my beautiful sister. But, it was her card that was most compelling. The words still haunt me to this day. At the bottom of the card, she wrote, “Next year, I hope that we will both be in a better place…I love you, Kass” I have no words for how this moved me then, and what reading her message still does to me today. But, looking back, not everything that happened on this trip was sad. There were many amazing moments. Here are just a few: My Dad and both brothers (Tim & Tom) made a surprise visit to NIH on Easter morning. Kass was so happy. When they walked in the door, she just sat there in disbelief and cried. I was so happy that we pulled that off! It is a moment I will never forget. Also, the quality time that the three of us were able to spend together during those weeks was amazing. Before we left to go home, we took Kass out to the courtyard in her wheelchair to get some fresh air for the first time in many days. As we sat there, she looked up and said, “Do you hear that bird?” Mom and I heard nothing. She turned her head and said, “There. It is over there.” And, sure enough, there was a bird in the tree. When we arrived home with Kass on that April 12, 2012, I slept in my bed for the first time in almost 2 weeks. I was drained. But, I missed Kass. We had spent so much time together, I was missing her and wondering if she was okay. That was a Thursday. The following Monday, Kass and Josie came to my house and spent the entire week with me. I took care of Kass and played with Josephine. It was an amazing week filled with light and love. More time. More love. More memories. So, this is why birthdays will never be the same for me. Last year, I tried to have a happy birthday. It was my first with Jamie, and we had a lot of fun. He took me for sushi, which is another of my favorite treats. The next night, he had arranged a get together with some friends, a fun night of celebration. Jamie is hands-down, the most amazing gift in my life. I treasure him and our time together. Every moment of it. I am not sure what I would do or where I would be without him? But, I cannot seem to explain it in a way that seems adequate. Those who know grief will know. Even when I try to be happy, there is always a layer of loss, and sadness, and pain inside of me that never goes away. People say that I am having a hard time dealing with my grief. You know what? They are right. They are right and I make no apologies for it. Losing Kass is not something I ever want to “get over”. I am searching to understand a way to live without her, and I find that each day continues to be a struggle to see the best path forward. I read this quote on Facebook just this week: “It has been said, “time heals all wounds”. I do not agree. The wounds remain. In time, the mind, protecting its sanity, covers them with scar tissues and the pain lessens. But, it is never gone.” –Rose Kennedy. Oh, how true. The pain is never gone. On that day in July, I lost a piece of myself when I said goodbye to my sister. Like losing my right arm, a piece of me has been taken away and it is never coming back. Life will just never be the same. We were supposed to grow old together…sharing stories from the past and celebrating the moments yet to come. To this day, still none of it makes any sense to me. But, one thing is for certain. Kass is no longer in pain. She now walks with God in Heaven. And, just as she predicted on this very day just 2 years ago, she now finds herself in a better place. I miss you, my sweet sister! Oh, what I would do for just one more birthday hug from you. As I recalled this story with my Mom just this afternoon, after we spoke, she sent me the most beautiful email. She reminded me of all of the things I already know about living my life, finding happiness, moving forward, and knowing in our hearts that Kass knew how much we loved her, and that she wants us to be happy. These things I know and accept, but it is sometimes difficult to reason with the sadness. I know I will walk beside Kass again someday. But, today, on this night, I will take my Mom’s words and I will try to live them. I am headed out the door for another birthday dinner with the man I love. He is right here in front of me. Today. Now. And, I do not want to miss a moment with him. Paternostro Family Foundation and Raise the Region! The Paternostro Family Foundation is excited to participate in our second Raise the Region event! It is hard to fathom that Dad will not be with us during the Raise the Region kick-off event this Wednesday. But, we know he would want us to keep going. He worked the room last year because he believed in our mission and in our purpose. We plan to carry forward in honor of his strength and Kass’s courage. 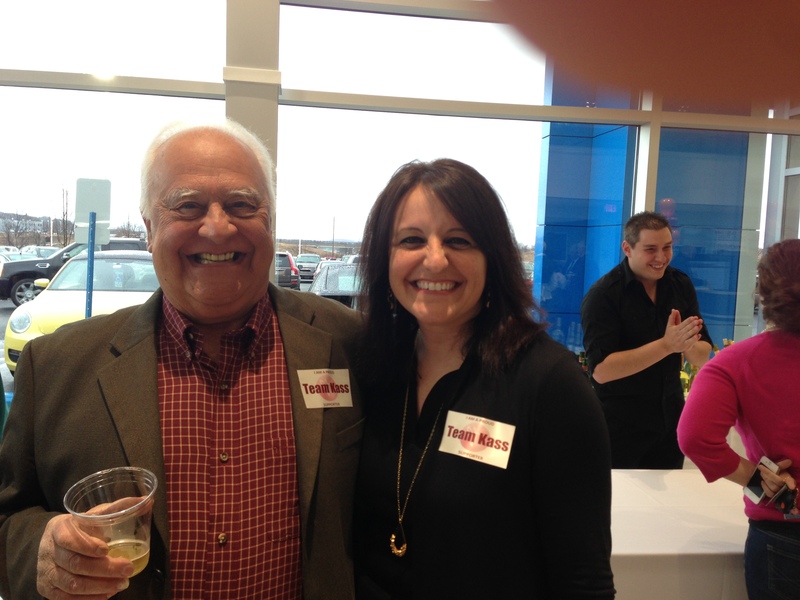 Dad and Krista at the 2014 Raise the Region Kick-off event! Giving, even just a little bit, makes your heart lighter. Please remember the Paternostro Family Foundation during this online fundraising event. We are forever grateful to all those who believe in our foundation, and in our desire to harness hope and live passionately. If you are not familiar with Raise the Region, it is a unique, online giving event that provides a platform for the community to raise money for local non-profits within a 30-hour fundraising window. The event begins at 6:00 p.m. on Wednesday, March 11, 2015 and ends at 11:59 p.m. on Thursday, March 12, 2015. What is most amazing about Raise the Region is the generosity shown by the event sponsors to provide matching funds which truly extend the impact of your donation! We are fortunate to live in a region focused on supporting the community in which we all live, and we are proud to do our small part for the greater good. It is in that regard that we ask you to consider making your annual donation to the Paternostro Family Foundation as part of the Raise the Region event. Each donation is fully tax-deductible! Your donation may help to underwrite part of a memorial scholarship for select graduates of Hughesville High School, provide a bag of hope to a newly-diagnosed cancer patient at Susquehanna Health Cancer Center, or help a person fighting cancer to make a monthly utility payment. Each dollar invested in our Foundation has meaning for someone, and we are so thankful for each and every donor. Every dollar raised is so special to us. We know that there are many wonderful organizations to support this week. But, as a newer non-profit with the passionate determination of a seasoned institution, the Paternostro Family Foundation is eager to grow and to expand our programs and partnerships. Your financial support will be of tremendous value to us. 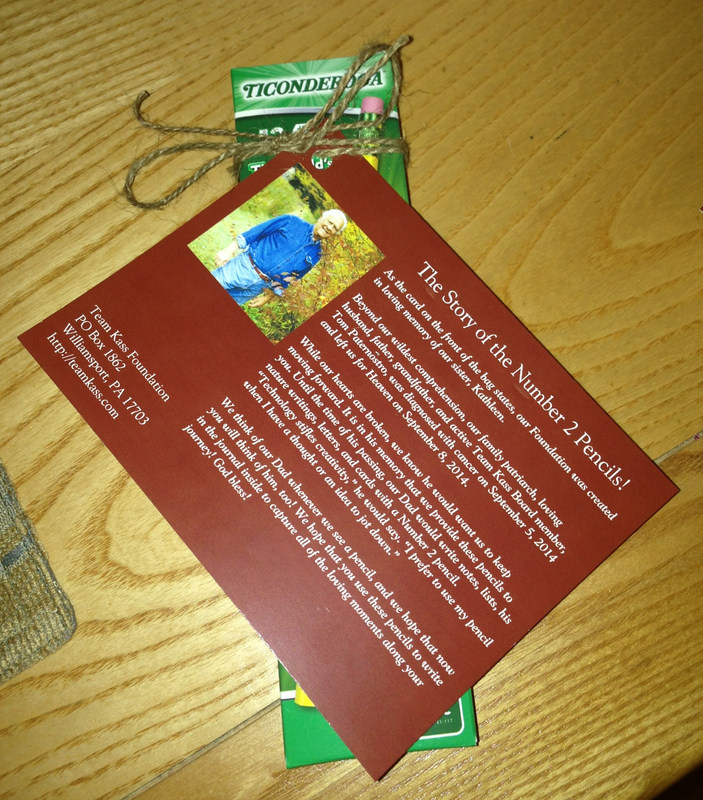 The minimum gift is $25.00, and any donation amount is truly meaningful and appreciated. Thank you in advance for your continued generosity and support. 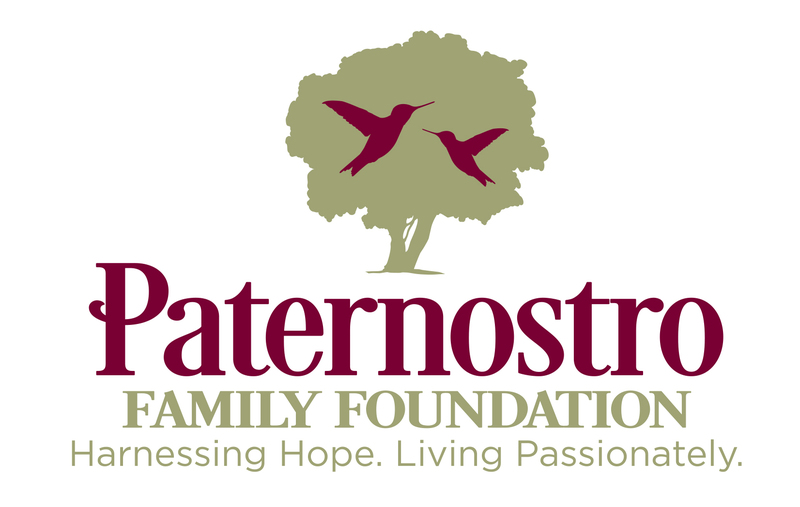 Enter your email address to follow Paternostro Family Foundation and receive notifications of new posts by email.